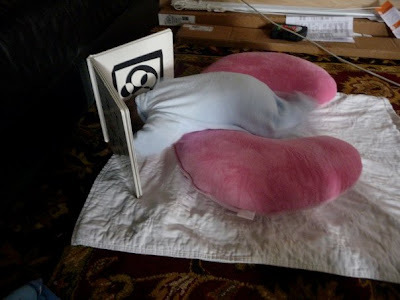 Baby Evelyn, a friend of Lolly’s, really likes to throw herself into her reading. >I'm sorry, but this looks like cruel baby-as-amusing-prop to me. She has progressive preschool, non-competitive soccer, and suzuki lessons to look forward to for the next few years. Poor little sod. >You think? My grandson at just a few months found this book irresistible, and I hear anecdotes about babies trying to crawl into books all the time. Lighten up.